During 2005, I did what in the Kingdom of the West is known as the run for the Golden Poppy. It is an arts and sciences competition that runs for 1 year. You need to enter 8 of 20 competitions and emerge with qualifying scores. The person with the best overall score is offered entry into the Order of the Golden Poppy and serves as Kingdom Artisan for the next year. The symbol of the Order is a Golden Poppy - a 4 petaled gold/orange poppy. Left is the painting which was the inspiration for the sleeve project. 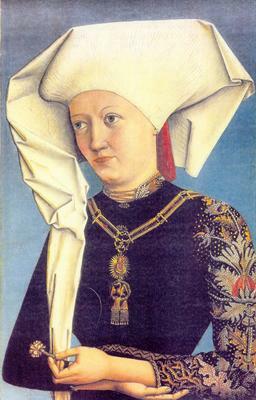 The painting is from 1490 by Anonymous Master active at the Court of Ansbach - No. Inv. 54(1935.2). The painting is in the Tyssen Bornemisza Collection. It is of a woman who has been inducted into the Order of the Swan. The Order of the Swan, also known as the Order of Our Lady, was founded by Frederick II, Elector of Brandbenburg in 1440 and originally comprised of 30 gentlemen and 7 ladies. The Order spread quickly and branches were established in the Margrave of Ansbach in 1465.The symbol of the Order is a medallion of the Virgin Mary to which is attached a symbol of the Swan. Her sleeve is decorated in items that are symbolic for her. There is a pomegranate, acanthus leaves, and other foliage. Foliage is seen in nearly all of the sleeves of this style. The materials for her sleeve are pearls, coral, and gold spangles. Many of the veins are spangles layered in rows. The design encompasses the whole outer portion of the sleeve and is a continuous flow of pattern. The main element of the pomegranate is centered on the middle of her upper arm. The collar is also pearls and spangles. A close look shows that pearls of differing sizes were used for artistic rendering of the elements. 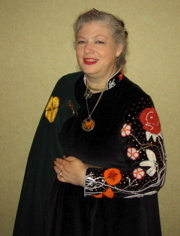 I designed my sleeve to reflect my personal symbols - the garden rose and the Golden Poppy as this was to be my dress for admittance to the Order of the Golden Poppy. It has a half bloomed garden rose (my symbol), a rose buds, rose leaves, garden roses such as you see in the herbals and later in Tudor embroidery, a full golden poppy - 4 petals (the Order), poppys in bud and half blooms, and foliage. The rose - red and poppy golds are done in coral beads; such as you see on the chasuble from the Chicago Museum of Art (1965.773). The leaves and general foliage are done in pearls. Pearls were also used to give definition in the larger roses and in the garden roses. The stems are a mix of spangles and pearls. The flood of spangles in the background are 14 k. gold. There are 4 different sizes of coral beads and 6 different types and sizes of pearls. In designing the sleeve, I was most conscience of the artistry involved in the sleeve in the portrait. It told a tale and was visible from afar. While there is lots of detail in the sleeve, the pearls used in the design were not small - not seed pearls. If one presumed the collar is 1-1.5"/ 25-37 mm high on her neck, and there are 5 graduated pearls on the opening - that would mean that the pearls ranged from 2-7mm in size. I used 2-5 mm for my sleeve. There are round pearls and oval pearls. 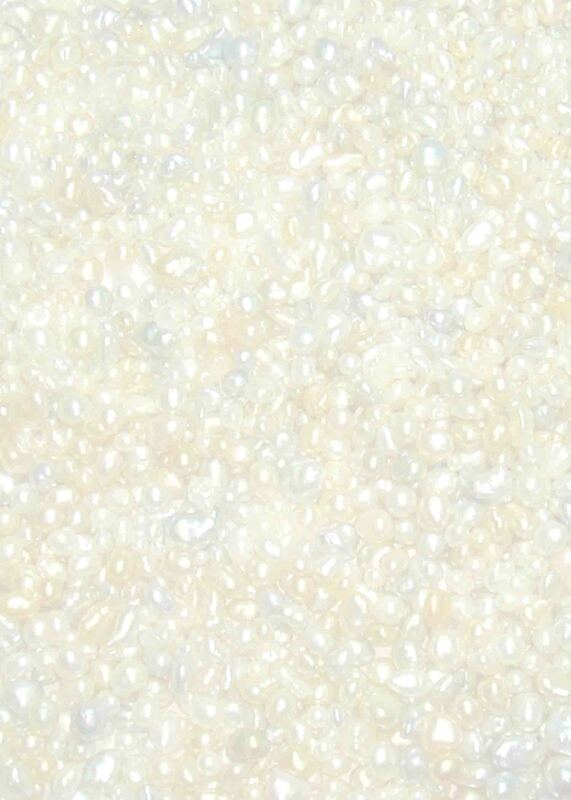 There are also fresh water pearls of various shapes being used to create details. The slate frame was laced with muslin. Then the cotton velvet was stitched down. The outline of the sleeve and collar was stitched in a running stitch to give me guidelines for the embroidery. Then the main pieces were chalked onto the velvet, following the outlines from the pattern which had been drawn on tissue. Additional elements were chalked onto the velvet as embroidery progressed. See pictures and additional commentary below. 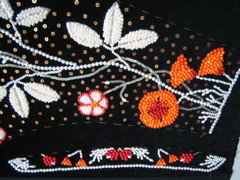 Each pearl and coral bead was either added individually or couched down. 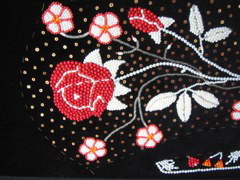 The couched areas are the lines of beads at the edge of the sleeve and collar and the large roses' stems. These are couched down to give a smoother line. 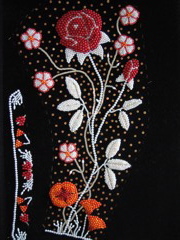 Pearls and coral beads were applied individually to fill areas of design like the roses and poppies. 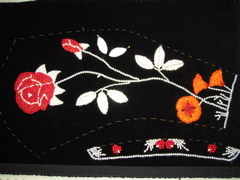 Both techniques were done in the 15th and 16th pearl embroidery. Once the main elements were embroidered, the spangles were added in a random fashion for the background filling. Each spangle has 2-3 stitches. When all the embroidery was completed then the piece was removed from the frame and sewn into the dress. The reminder of the sleeve edge was then embroidered. 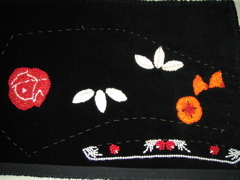 Since the sleeve and collar are lined, the back of the embroidery is protected. There is a lot of 3 dimentional lift in her sleeve. The pomegranate and some of the leaves have very defined lift. While this is a portrait, this type of padded embroidery was common for goldwork of the period so it was a well known technique. Each of the main features was padded with wool felt. For some of the pieces, like the rose and poppy, there are up to 3 layers to ensure curvature. The felt is laid down on the velvet and applied first. Then the beading is done. At this point in the embroidery, you can see the rose has been padded up. 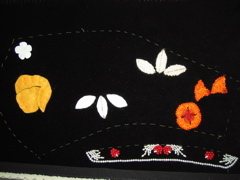 One set of rose leaves and the large rose have their felt base. The rose has been completed here. Freshwater pearls were used to add definition to the rose. The rose has been completed; as is the bud. The rose leaves are in and the couched pearl stems have been completed; including the thorn. The garden or wild roses have been added. Their stems are made of spangles that have been stitched in an overlapping pattern similar to the portait veins. These have a gold wash, but next to the 14 k gold spangles, look more silver. The collar is complete. All the 14 k gold spangles have been sewn down. Final of the sleeve and collar before being removed from the slate frame. Virgin Sheltering Supplicants - Order of the Swan - Real Online & see also Thyssen-Bornemisza Collection Early German Painting 1350-1550 by Isolde Lubbeke ISBN 0856673765. Pg 48 Franconian Master 1500 with Countess Sophie of Poland and the daughters of Margrave Albrecht Achilles from The Virgin sheltering Supplicants under her Cloak – reverse of alterpiece in the Schwanenenordens-Ritterkapelle in St Gumbertus, Ansbach. Ursula Grekin by ULM Master, c 1500 - Thyssen-Bornemisza Collection Early German Painting 1350-1550 by Isolde Lubbeke ISBN 0856673765. Note pg 44- 49 – references to Ursula Gerkin, -- embroidered oak leaves, notes on costume including reference to single sleeve work and pearl embroidery.